TW: Your first serial was Universal’s “Adventures of Frank Merriwell.” How did you land that job? HP: One morning while looking over the trade papers, I came across an article mentioning that Universal was looking to cast the children of famous Hollywood personalities as featured players in an upcoming serial. I immediately phoned my agent and informed him as to what I'd read. A day or so later, he called to say he couldn't get anywhere with Universal’s casting office. However, he did come up with a bit of encouraging news. He’d heard the studio had tried to get Tyrone Power Jr. for one of the roles, but Power’s agent turned them down. So I decided to take matters into my own hands. I knew Henry MacRae was going to produce the serial, and since he had been the production manager on many of the projects my father did at Universal in ‘25 and ‘26, I decided to drop in on him. Going over to the main gate, I had the intention of walking through, but the guard on duty had other ideas. Despite my persuasiveness and name-dropping, he refused to let me pass inside. Having worked at Universal only a few months earlier in “Yellowstone”, I was aware MacRae's office was situated on the back lot. What I did next would be impossible today due to the hi-tech security system undoubtedly now in place there. I drove to the east side of Cahuenga Boulevard and came upon a small dirt road near a hill on the side of the studio. I parked my car, got out and started walking. A hill was the only thing separating me from the studio’s back lot, and the chain link fence there posed no problem. The whole thing only took a few minutes. Once I was on the lot, nobody bothered me. I strolled up to MacRae’s office, walked in and introduced myself as the son of House Peters. MacRae was pleased I dropped in to see him. After some small talk about my father, I asked about a part in “Merriwell”, and he gave me the role of the hero’s adversary. They used my real name, House Peters Jr., as the name of the character. TW: MacRae also produced “Flash Gordon”. 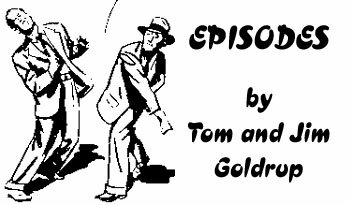 HP: He produced quite a number of serials at Universal, and “Flash Gordon” was the most famous. I played one of the Sharkmen. I wore a leather thing around my waist; the hair was shaved off my chest and legs; and a skullcap was put on over my hair. (I still had a pretty good head of hair in those days but it was receding badly in the front.) The rest of me was covered with body makeup, which in those days was greasepaint. Makeup consumed, oh, an hour in the morning, if not longer, then I was ready to play a Sharkman. TW: How well did you get to know Buster Crabbe? HP: Real well. He was an extremely nice guy but rather quiet, a guy who kept to himself quite a bit. I remember he hated his hair being dyed (blond) like it had to be for the show. When he’d go to the commissary, he’d wear his hat—he didn’t like the color of his hair, he thought it made him look unnatural. 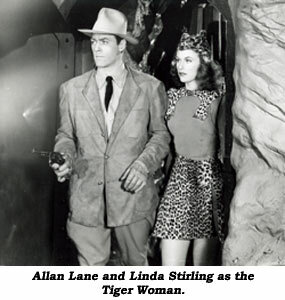 I got to know Jean Rogers (Dale Arden) pretty well; and Charles Middleton, who played Ming. Middleton was a Broadway actor, and pretty damn good at what he did back there. He came out here and played Ming and he did a terrific job—very few people could play Ming. TW: You tell a funny story in your book about liking Henry MacRae’s car and getting hold of it yourself after he traded it in. HP: It was a ‘34 Ford, and it was a beauty—black, suicide doors on it. Wish I had it today, it’d be worth quite a bit! But the very first day I drove it onto the Universal lot, there was a heavy wind that blew over a flat, and the flat landed on the roof of the car! MacRae was the first to notice what had happened and, forgetting he was no longer the owner, came over to us and began shouting, “Who the hell parked my car where a flat could fall on it? !” I told him it was now my car, that I’d bought it after he traded it in, but he didn’t give a damn about that, he said I should be taking better care of it. TW: Twenty-something takes—I hope that sort of thing didn’t happen to you very often. HP: The reason that happened was that, as usual, they changed dialogue just before we went into that scene. You’d come onto the set all prepared for your scenes, then somebody would say, “Hey, House, we got a little change here...” And you just had to wing it, because if you couldn’t, you’d never be rehired. For me, I think it was a throwback to my grammar school days when I was always the last one out of class because I took the longest memorizing a poem. Memorizing was not easy for me, I could not wing a script like Broderick Crawford could, for instance. 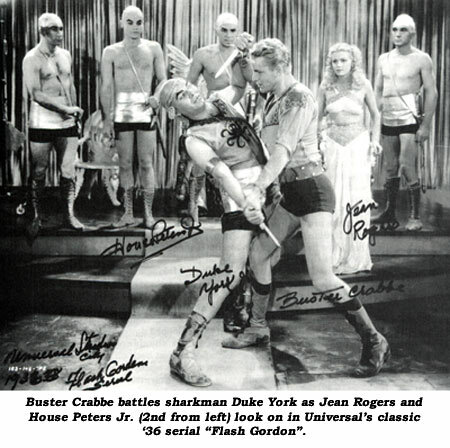 TW: You and Buster Crabbe and several stuntmen have some underwater fight scenes in “Flash Gordon”. HP: We shot that in a big old steel tank that had been constructed years earlier on the Universal backlot. It was probably 11 or 12 feet deep and held thousands of gallons of water. Up on the top was a platform that held the big floodlights they aimed down at the water. The tank was round and it had four big windows for the cameras outside to film in through. But one of the windows was cracked, and somebody had reinforced it with carpet-covered planks that were propped up against it with two-by-fours and a four-by-four. So they just used the other three windows. The glass in those windows had to be about an inch thick, or thicker. We’d fight underwater, at the window level, down at the bottom of the tank. I didn't have a stuntman help me at all, I had to do my own. Buster and I had to fight because we had closeups. But I was pretty agile at 19 years of age, I knew how to swim and all that. We could fight underwater for 20 seconds, 30 seconds, and that was about it. They’d be outside filming in through the window. And, that water was cold—colder than heck. In fact, I remember there was snow on the ground outside. It was the first time in a long time that you saw snow in the San Fernando Valley. Man, when we got out of there, with the wind and the snow from the night before, it was cold. The prop men really looked after us—blankets and hot coffee and so forth. I was so blue, one guy brought a glass and he said, “Here. Drink this, House. It’ll help ya.” It was straight whiskey. It’s the only time I really drank straight whiskey on a set. The next morning, I come on the set and Buster’s there, and he gets up out of his chair and says, “Come with me, House.” We get in his station wagon and I notice there seems to be more water on the ground as we proceed across the back lot—mud and so forth. We come down to where the tank is, get out of the car, and he takes me over and says, “Take a look at that. Take a look at where we worked yesterday.” Well, the shored-up window had blown out, and thousands of gallons of water had flowed all over the lot. And there was thick, jagged shards of glass still in the window frame. Buster said, “Can you imagine if we’d have been on the bottom when this happened?” We’d have been cut to ribbons. I didn’t make too much of it, but I’ve got news for you, Buster and I drove back to the set rather mute, thinking about it! TW: Years later, after the war, you were also in some Sam Katzman and Republic serials. HP: Sam Katzman was a character. He was always on the set, smoking a cigar—he was a great one for visiting and sitting around the set and chewing the fat. And he had a walking stick with an electric battery in it. He got a great kick out of using that on people, especially girls. He'd approach them with it and jab their knee or their leg in the back! Needless to say, he was a producer who worked on slim budgets. I remember one time when my agent was in Katzman’s office trying to get me $75 a day for a role rather than the $55 Sam was offering. I was standing outside the office door smoking my pipe and overhearing everything that was going on. Katzman would not budge, he insisted he didn't have any more. Then he picked up the phone and dialed his bookie and put a thousand dollars on a horse! And he couldn't afford giving me a lousy $20 raise? TW: I know you guys all worked long hours on serials. HP: Oh, very much so. There was no union in the early day. Sometimes we quit at 11 o'clock at night, or at midnight for that matter, and get a six or seven AM call. All the (serial) directors I worked for were well-liked by the producers because they could bring the pictures in on budget and on time, and that meant a lot to the producers. 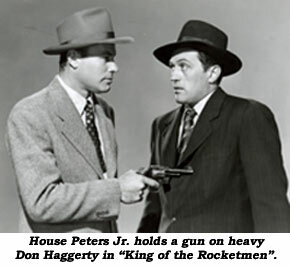 In “King of the Rocket Men” my character for a change was a nice fellow named Bruce Winslow, publicity director for a group of scientists who developed secret weapons for the government. Despite its low budget, this serial had some very plausible special effects. 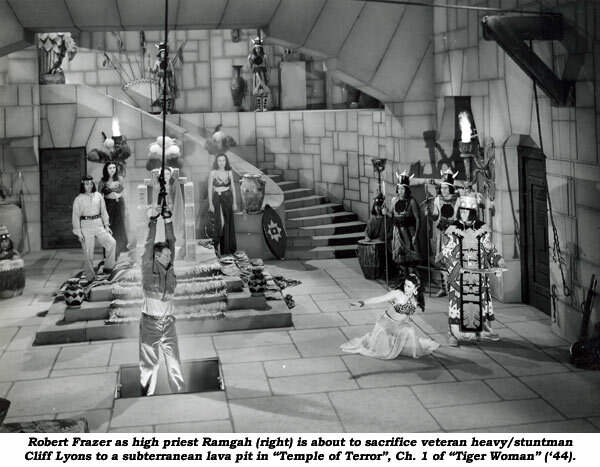 Howard and Theodore Lydecker, along with stuntman Dave Sharpe, created the illusions. I remember being present on the lot when some of the footage was shot of Rocket Man flying through the air with arms outstretched in a horizontal position. They attached a mannequin to a wire strung out from one sound stage to another. At its highest point the wire was probably about 100 feet above the ground, descending downward across the studio lot. When the mannequin was released from the high position and allowed to slide down the wire, the illusion of flight was created. Later, in the cutting room, this footage was spliced together with a shot of Sharpe as he bounced upward from an off-camera trampoline. In fact, Dave, in addition to doubling as Rocket Man, practically doubled all of us at one time or another. Other doubles were hired when it was necessary. This simple yet effective technique was repeated at Iverson’s Ranch and also on Mulholland Drive to obtain sequences showing Rocket Man flying above rural sections of the city. Back then, Mulholland Drive was ideal for such use as it was both remote and rustic, extending from Cahuenga Pass almost to Malibu. Anyone who has seen Rocket Man will remember cars and trucks tearing around on hillside roads. Most of those scenes were done approximately where Mulholland Drive and Laurel Canyon intersect. One day while watching Dave rehearse his stunts, I asked him about his habit of keeping an unlit cigar in his mouth. With a smile, he explained that a few years earlier he had been filmed without his knowledge while rehearsing a stunt. This footage was then used by an unscrupulous producer in one of his future films and Dave was never compensated. So that was the reason for the cigar. I’m frequently asked about the Rocket Man suits, and the fact is there was more than one. I remember Dave Sharpe had two, and Tris Coffin had two tailored to his build. There were also two or three for the mannequin and a couple in reserve. The cast was a congenial group of actors. I spent a lot of time with Don Haggerty. We both shared an interest in the stage. Don had been brought to Hollywood from New York by one of the studios. However, nothing came of his contract and he drifted into B-films and serials. Republic Studios had quite a wardrobe department. It contained so much vintage clothing that it usually wasn’t necessary to use Western Costume for outfitting. However, for the cast of “King of the Rocket Men”, we needed a contemporary look. So we went to Isenberg and Isenberg’s, the same place Universal sent me 10 years earlier for my part in “Adventures of Frank Merriwell”. 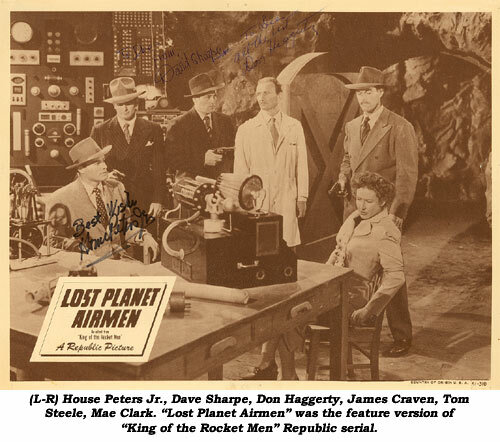 There was no wrap party when “King of the Rocket Men” was completed; there seldom were any when one of these B-films was finished. As soon as the cameras stopped rolling it was over for us and we went home. 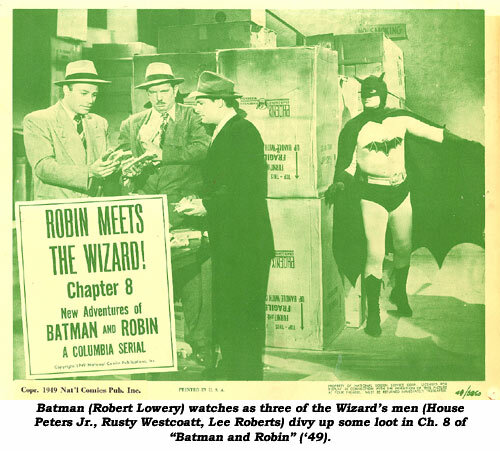 It wasn’t long before I was working in another serial, this time for Columbia in the 1949 version of “Batman and Robin”. None of us thought we were making anything worth remembering. Here again, we did it to pay the bills while waiting for something better to come along. I well recall Charles Quigley and John Doucette from “Batman and Robin”. 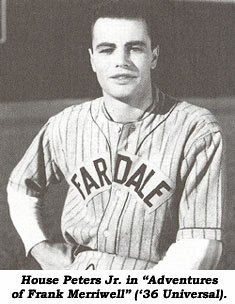 During his time in Hollywood, John Doucette worked in over 130 pictures. He had a certain quality about him that people remembered, particularly when he played a heavy with that gruff voice it really sounded menacing. That’s why he was hired to play outlaws in a number of the bigger budgeted westerns. In “Batman and Robin”, this is when John and I met. both of our characters were thugs, members of a gang that operated under the direction of a villain known as The Wizard. The show had 15 chapters, so we had plenty of time to get to know each other. While chitchatting during a lull in the shooting, we discovered we both shared an interest in live theater. 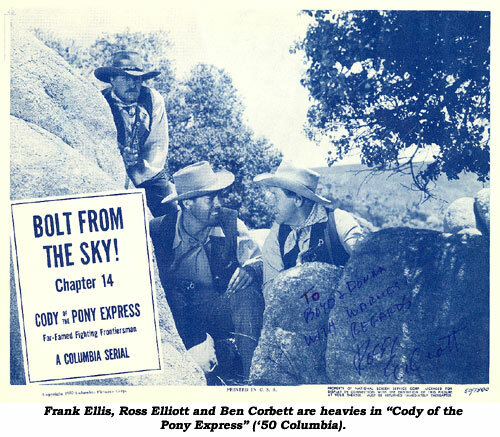 The following year we met up again in a Tim Holt western, “Border Treasure”, in which we played heavies. Lucy and I spent some time with John and his wife Kathy. Our children were the same ages, so we started celebrating their birthdays together as we watched the two families grow. While we were living on Burbank Boulevard in Van Nuys, John even came over one morning to help me pour a concrete slab when I was adding a bedroom shortly before our eldest son was born. 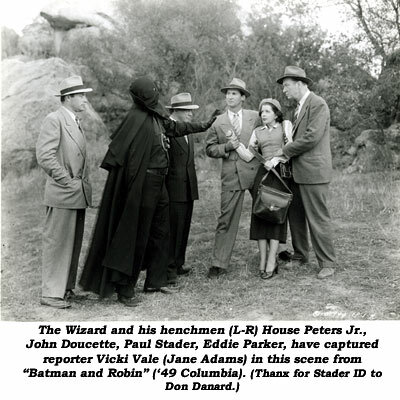 Our friendship with Charles Quigley and his wife Harriet also began while I was shooting “Batman and Robin”. Charles was on the Columbia lot working in another film at the time. Here again, our mutual interest in the stage brought us together. Charles had become fed up with Hollywood by then. He had done a number of leading roles in various films, however, by the late ‘40s, he began encountering roadblocks. Unfortunately, Charles had been in too many serials and found himself typecast as a serial lead. He couldn’t get decent parts doing anything else. He told me he either had to accept roles in serials or leave the business. He needed the 12 to 18 weeks of steady work provided by those shows, so he took whatever they gave him—until he saw his salary dropping $100 a week with every one he did. This all came to a head one day when his agent confronted producer Sam Katzman about the downward spiral in Charlie’s salary. Sam’s excuse was always the same: they had a barebones budget on this one and he couldn’t afford to pay any more. Charles had seen his weekly salary drop from $800 to $600 by the time I met him. When Katzman told his agent this next serial would pay only $400, Charles couldn’t contain himself. Up to that point, he’d been quietly standing in this producer’s office while his agent did the dickering. Now, he leaned over Sam’s desk, looked him in the eye and said, “What the hell is it? I’ve worked hard for you. I am always here on time, I always know my dialogue, and I don’t have a drinking problem. You’ve told me you’re happy with my work, but every time we negotiate, you drop my salary. Well, now I’ve had it. This is the last job I’ll do for you!” Having said that, he picked up his script and bolted out of the office. Charles’ case wasn’t the only example of Katzman’s lack of generosity when it came to salaries. Some of the exteriors for “Batman and Robin” were filmed on the site of an old oil refinery in the vicinity of 125th Street and Western Avenue in south L.A. We used this locale for at least two different chapters in the serial: a synthetic diamond factory and a research plant. There were catwalks and metal steps along the outside of the buildings; ideal for an action serial. We also did location filming in the industrial section of downtown L.A. Columbia leased a vacant multi-story building to serve as the interior of the gang’s hideout. Inside were hallways and offices which the director, Spence Bennet, put to good use. This quiet spoken director had made many serials by then and generally was ahead of schedule. It’s veteran heavy Edmund Cobb behind the false nose, dark glasses and mustache disguise of the Rattler in Mascot’s Mystery Mountain” serial. The Rattler is revealed to be (I won’t say who in case by some odd quirk you’ve never seen the serial). Altho Cobb anonymously played the Rattler for 12 chapters to confuse viewers with his voice, he received no screen billing. It sometimes amazes me the things Hollywood could get away with in serials which never would have made it past the boys at the Breen Office or any of the other regulatory agencies that policed movies in the Golden Days of the movies. Did they even bother to take a gander at the content of cliffhangers which were, at least in theory, primarily aimed at juvenile audiences, the group most would think of when considering protection from gratuitous violence and or moral and social corruption? Take Republic’s 1944 “Tiger Woman” for instance. The audience is no sooner drawn into Chapter One than it’s introduced to the title character, the reigning queen of a certain undisclosed country who presides over the territory and safeguards her subjects with a feverish intensity. Interlopers are not merely escorted to the border with a stern order not to return and a minor slap on the wrist, but are summarily tied to a rope and dangled over a stalactite infested subterranean cave and dropped into a lake of volcanic fire below. Talk about a quick cure for an immigration problem! It also becomes fairly obvious from the dialog that this isn’t a once in a lifetime episode, but rather this sort of cold blooded and horrific sacrifice goes on all the time thanks to the Tiger Woman. Or as one native character explains, “Once the Tiger Woman gets her hands on a white man, it’s the end.” And she’s the heroine of the film! Can you imagine if a mainstream film of the same period tried to foist off a central female character responsible for such wanton murder? Even Joan Crawford in her fullback shoulder pads and at her nastiest couldn’t get away with it. Of course, the heroes of this serial work for a huge oil company and I think you’d have a hard time today getting away with that one as well. 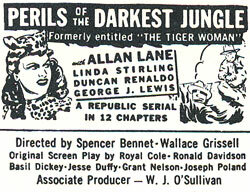 In any case, the Tiger Woman (who inexplicably sports a leopard spotted outfit which is not nearly as appealing as Francis Gifford’s earlier “Jungle Girl” getup and at times looks more something a Ziegfeld girl or Radio City Rockette might sport) is played by Republic’s then newest female discovery Linda Stirling, a former model whose first foray into cliffhangers this was. According to Stirling, her studio audition was more in the nature of an athletic test than a traditional acting scene. And this would certainly come in handy in a serial such as “Tiger Woman” where the heroine gets involved much more with physical action than in other less athletically demanding chapterplays. Whether riding, shooting or employing judo moves, this is one lady who’s not afraid to mix it up. 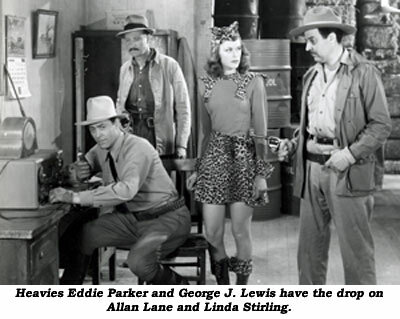 She does have help, however, in the person of intrepid heroes Allen Saunders (Allan Lane), later the popular (except with his co-stars) star of many B-westerns, and the always reliable (and future Cisco Kid) Duncan Renaldo as Jose who for a short time in his career seemed to always show up in serials as the hero’s staunch ally. Lane is not much of an actor, painfully stiff and rigid (even for a serial hero), but Renaldo, as always, is relaxed and enjoyable to watch. Fleshing out the cast, mostly as villains, are familiar serial mugs George J. Lewis, LeRoy Mason, Robert Frazer, Keene Duncan, Stanley Price, plus a large contingency of the studio’s actor/stuntmen including Tom Steele, Duke Green, Eddie Parker (the same year he doubled Glenn Strange in “House of Frankenstein”), Ken Terrell and Cliff Lyons. Veteran director Spencer Gordon Bennet helms this time with the aid of Wallace Grissell from a script by Royal Cole, Grant Nelson, Jesse Duffy, Basil Dickey, Joseph Poland and Ronald Davidson. There’s only one Lydecker in the credits this time, brother Theo, but he’s more than up to the challenge of creating the necessary miniatures and special effects of which there are some good ones. I particularly enjoyed the rapid-tossed boat going over the cliff in Chapter Four. turn out that way with lots of action, mayhem and thrills ensuing before the conclusion of Ch. 12. “The Tiger Woman” is a good solid serial. Plenty of action and, for a novice actress, Linda Stirling is appealing, likable, decorative and convincing in the rough sequences. No wonder Republic decided to employ her services in many more serials. Good pacing and lots of exciting tight corners elevate this one to B+ status. At the end of Ch. 8 of “Red Barry”, Mannix fires from the dock, apparently hitting Red (Buster Crabbe) who is on the boat. He falls, grabs for the edge of the boat, then falls again. But in Ch. 9, as Red grabs for the edge of the boat, he hangs on and some men pull him up.